Films with London in the title aren't the only films about London - there are also loads of films that feature London, almost as a co-star. In this series, we'll take a look at those films - both the good and the very, very bad. 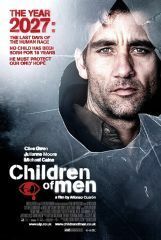 Children of Men is another one of those films which sticks out in our mind as a fantastic London film, but turns out to spend very little time in our fair city. But the time spent in London is very well spent indeed. The year is 2027, and society has slipped into a rapid decline after women stopped being able to give birth in 2009. Britain is one of the last surviving countries in the world, and a strict no foreigner policy has been instituted - all foreigners are rounded up and shipped off to internment camps set up in south coast towns and cities. As the film opens, the world’s youngest man has been killed and this has sent Londoners into a tailspin of grief. Well, all of London except Theo (Owen), who uses the tragedy to skive off work and visit his friend Jasper (Caine), a disgraced former political cartoonist. Theo narrowly escaped being blown up in a cafe bombing that morning, and that’s left him understandably on edge. His day gets a little bit worse as he is kidnapped by a group protesting the treatment of foreigners. It turns out the group is run by his American ex-wife Julian (Moore), who needs a favour. She needs to get travel passes to get someone to Brighton, and Theo has some family connections that might be of use to her. We also loved how the segregated areas of London are delineated by tube zone. That’s actually part of why the film creates such a real 2027. There are no flying cars and robots - this is futuristic London that’s based on logic. It’s London as we know it, but technology is slightly updated. Evening Standard posters are no longer written, but are animated ads. Billboards are playing on buildings on Regent Street. Ads on the sides of buses are animated. People still work in cubicles, just with fancier looking computers. The government supplies anti-depressants, but marijuana is still illegal. It’s a very real world, and a very believable one. The passes Theo manages to get are for Kee, who despite 18 years of worldwide infertility is pregnant. Of course, it all goes wrong as soon as they get out of London. Julian is killed. Theo overhears a plan to use Kee and her baby for political means and smuggles her to safety. With the help of Jasper, they make plans to meet the boat to safety Julian had arranged. But it all happens outside of London, so we’re not that concerned about it. This is a very interesting, and though provoking film. And one we enjoyed very much. We would have even enjoyed it even if Clive Owen weren’t so handsome. And we have to applaud the filmmakers for one of the smoothest examples of exposition we’ve ever seen in a film. Four and a half minutes in, and you’re completely up to speed on this world and its problems, without even one character having to say “Oh, isn’t it so hard that it’s 2027 and no one can have any babies” to any other character. Well done, we say. We’re not sure if London in 2027 will look like the London of Children of Men, but we wouldn’t be surprised. And if it does, we really have to give Cuarón and his crew credit. Time Spent In London: Really not very much! A mere twenty minutes by our count. London Icons Spotted: Not as many as one might expect - the BT Tower and Big Ben are seen at a great distance. Trafalgar Square, the Admiralty Arch, and Battersea Power Station all featured, and used quite cleverly. Glaring London Errors: None, really. It’s a well done film. Things They Got Right: Train journeys are still a pain in 2027. Which saddens us, but it’s not really unexpected. And we very much enjoyed that in one scene, Theo wears a 2012 Olympic jacket. Nice!